Campers at Mohawk can partake in our Equestrian Program in one of two ways: Through Equestrian Camp or through Riding Lessons. 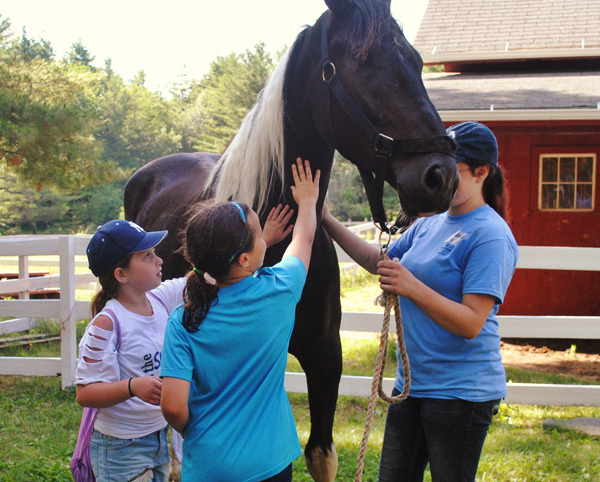 Riding Lessons are available to all campers, regardless of age or ability. 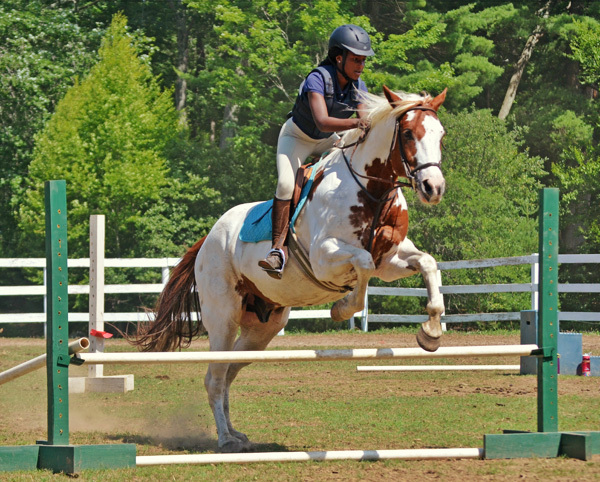 Equestrian Camp, as described below, is suited for advanced riders who can’t get enough of the horses. Equestrian Camp is an intensive equestrian program. Girls that are at least 11 years old (by the first day of session chosen) are eligible. Participants must also be able to canter and perform low jumps and wish to spend a majority of their time at the stables. Participants in the program spend up to six hours a day at the stables and only have one elective activity per day. One morning each week, the girls trail ride through the woods around Mohawk Mountain. They will canter and gallop along the trail and explore the surrounding area. When they register for this program, campers will need to send a reference from their most recent Riding Instructor (other than Camp Mohawk) stating their level of riding ability before being they can be accepted. Only six campers per week are accepted into the Equestrian Program. Please refer to our Dates & Rates page for availability. All campers are welcome to participate in our Riding Lessons. The goal of our riding program is twofold. We want campers to be safe, and we want them to have fun as they ride. Horseback riding can be a lifelong form of exercise and enjoyment. We aim to introduce this sport in a way that will nurture a girl’s interest in horses. Riding lessons are taught in the English Hunt Seat style. Riding Lessons begin with basic skills such as mounting, dismounting, and helping girls feel comfortable around the horses. Campers soon learn proper foot and hand positions, how to maintain balance in the saddle, and the basics of controlling a horse. Intermediate classes move on to posting trot, gymkhana games, and fieldwork. Advanced classes offer instruction designed for each individual rider’s ability level, including dressage, jumping, and trail rides. We provide hard hats with safety straps and all other safety equipment. Boots are available if needed, but please bring a pair of boots or shoes with heels if you have them. This is important for proper foot placement in the stirrup. Please label all riding apparel. Our stable area consists of a barn specially designed for our riding and farm program, a paddock area, two riding rings, fieldwork area, and a small brook. Small group lessons are taught in riding rings with three instructors for each twelve students. Horseback riding lessons are available for $135 per week. This includes five 55 minute group lessons.